You can define the best speeches as much by the pauses as the spoken words. As much by the gaps as by the sentences they separate. Because they recognise the value of the pause, all the most effective speakers strive to put the same care and attention into their pauses as they do their scripts. 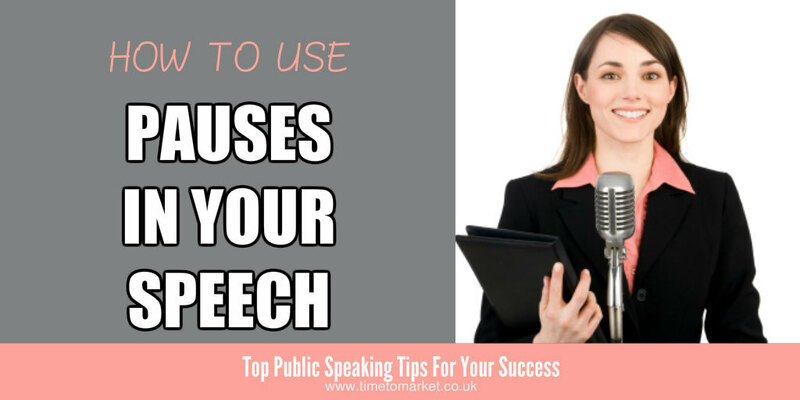 In this public speaking tip we look at how to use pauses in a speech. Set the pace. When you set the right pace in your speech your audience has a good chance to keep up. Listen actively and and understand you. Because that’s the chance to really understand. When you speak more quickly you increase the likelihood of your audience missing something or not understanding something. You know the signs: a scratch of heads, furrowed brows and an exchange of glances. Since it’s down to pace, slow down. So use effective pauses in your speech to slow down the pace and increase your audience’s understanding. Breathing. When your breathing is out of control your speech pattern also goes out of control. It’s mainly caused by nerves. But it’s equally likely when you are not fully prepared or familiar with your speech. Short, sharp breaths don’t lend themselves to confident speaking. So sentences become muddled. Pauses are non-existent or they occur in the wrong place. Your aim is to balance the needs to breathe and speak. Therefore strike the right balance and your speech pauses should be as eloquent as your words. Impact. Put the right emphasis on a word and it’s instantly noted by your audience. It’s important. And when you leave a pause after making that point it’s also noted by your audience. So it’s doubly important. It works because pauses add extra emphasis to your speech. They are equal to all your emphasis, intonation and volume. When you use them properly they will add weight, gravitas and value to your spoken word. Eye contact. When you look your audience in the eye you intend to get them engaged with your speech; engaged in a one to one dialogue. And when you combine this with a good pause you add extra emphasis to each of the points you make. Your eye contact and pause technique reinforces the all important one to one relationship that you want with your audience. So use eye contact and make it count for you. Rhetorical questions. Ask a question of your audience and you look for their engagement. Ask a question and pause…and you have their engagement. That’s because they can’t and won’t overlook your question. Your pause brings their focus straight to your question. Then, answer your question. Pause…and then continue. Giving a speech? Then you should really know how to use the pause and why it’s so important for public speaking. Use the pause to set the right pace for your speech. Control your breathing with pauses and stay in control as a result. Add special impact to your words with a pause. Because it slows you down and adds emphasis. Have eye contact and pause at the same time for extra effect. Use a rhetorical question and then…pause. Effective public speeches full of rhetorical device, intonation and structure are weakened without the all-important pause. Apply a solid pausing technique to your speeches and you can expect to become a more effective speaker. You can practise how to use pauses in a speech with a public speaking training course at your nearest PresentPerfectTM training centre. So, when the time is right to boost your public speaking skills, then please don’t hesitate to get in touch.